How To Use LinkedIn To Get Your Dream Job: The Best Tips! Don’t have a LinkedIn profile yet? Not sure how to create a polished one? Or how to use LinkedIn for job search? Here are eighteen LinkedIn jobs search tips to get a leg up on the competition. Try these tips while using LinkedIn for job search. Before we start looking at how to use LinkedIn, let’s note: Anyone considering LinkedIn jobs should create a LinkedIn profile for job seekers before starting a search, notes Chuck Hester, a LinkedIn consultant, speaker and trainer. An updated, well-written LinkedIn profile is an important tool in presenting your best professional face to potential employers. Make your online network reflect your offline connections. Once you set up your profile, start connecting with everybody you know: current and former colleagues, past employers, people in your industry, neighbors, family, friends, former classmates, says Serdula. Use keywords that hiring managers and recruiters are searching for. In your LinkedIn profile headline, don’t simply list your job title unless it’s extremely descriptive of the work you’re looking for, notes Nick Parham, a career counselor and executive coach who helps clients develop their LinkedIn profiles. Instead, look for keywords in the job descriptions you’re going after and, if they apply, incorporate them in your headline. 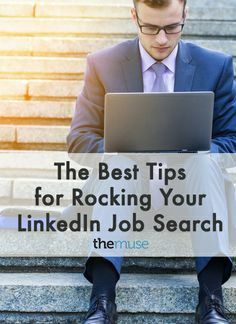 This helps your profile turn up in LinkedIn job postings searches for those terms and shows your suitability for the positions you’re seeking. Make your headline read like a newspaper headline. Along with keywords, your headline should “summarize who you are and the benefits you deliver,” says Serdula. “A successful headline compels people to read your profile.” She provides visitors to her website with access to her free LinkedIn Headline Generator. Write a compelling background summary. Your summary should “differentiate you from the hundreds if not thousands of other people competing for the same job,” Parham says. Tell a story. Talk about past and current job responsibilities, achievements, problems solved and passions. Don’t use long paragraphs; be concise. Mention quantifiable achievements. Write a “metric-oriented” summary, Hester advises. For example, if you’re a sales VP for a large corporation, mention that you increased sales from X to Y and developed X number of sales programs contributing to those results. Don’t list jobs held over 20 years ago. The goal is to showcase your career trajectory, not exhaustively list every job, says Serdula. Don’t conceal your age on LinkedIn, but don’t accentuate it, either—and jobs held more than 20 years ago do just that. Add your contact info. Some people hesitate to include their email address and phone number in their LinkedIn profile’s contact info for fear of receiving spam or marketing calls. Do it anyway, Parham suggests. Not everyone likes to use LinkedIn’s email system. Endorse and recommend others; they’ll likely reciprocate. Your LinkedIn profile should include endorsements as well as recommendations of your skills. The best way to receive them is to give them. Endorsements, because they’re so easy to give, don’t hold as much weight as written recommendations, says Parham. Join lots of relevant groups. There are countless topic-specific LinkedIn groups. When you join one, you can interact with others outside your professional network, exchanging ideas, tips and even job leads. Pay it forward. Think about how you can help others in your LinkedIn network, says Hester. Offer LinkedIn tips for job seekers and job leads, help them make connections to others. With luck, they’ll reciprocate. Use LinkedIn to research and connect to companies. If you’re going for a specific job, research the company on LinkedIn, advises Serdula. See who works there and if any of your contacts are connected to the company employees on LinkedIn. If so, ask your contact to introduce you to his or her connection at the company where you want to work. “It’s a great way to get ahead of the crowd,” she adds. Also, using LinkedIn to find a job requires u to use LinkedIn’s follow feature to read status updates from companies you’re targeting. Upgrade to a paid account, if only during your job search. How to use LinkedIn effectively for your job search may need you to opt in for a paid account. Though the free version of LinkedIn is “just good enough,” Serdula advocates upgrading. You’ll be able to message people on LinkedIn you don’t know (through InMail), and a Premium membership badge is displayed on your LinkedIn profile. “It indicates you’re a serious user, and others may feel more compelled to reach out and communicate,” she says. A Premium membership costs $40 per month if paid annually or $50 monthly. Periodically check out your contacts’ profiles. You might have missed the LinkedIn email in your box announcing that a contact of yours has a new job—at a company where you want to work and had no previous contacts. For this and other reasons, it pays to read your friends’ LinkedIn profiles on occasion to see what they’re up to, says Hester. LinkedIn is the de facto standard for professional profiles, and a strong LinkedIn presence is essential for any job seeker. But knowing how to use LinkedIn isn’t only useful for finding jobs. Many potential partners, employers, clients and colleagues will research you on LinkedIn. Your profile will likely be the first impression you make on them – which is why it’s important to continually build and update your profile throughout your career. Now Your Turn: Do you have any questions on how to use LinkedIn for job search, objections or contributions? Do you want to learn how to use LinkedIn more effectively? Share your thoughts by leaving a comment. And… don’t forget to share this post with others via Facebook, LinkedIn, Twitter, and what have you. Job Sites Are A Crapshoot! How To Move The Odds In Your Favor!